Rhubarb is so easy to grow, every gardener with the space, should have a rhubarb patch. There's nothing nicer than a warm rhubarb crumble cooked using your own rhubarb. December is a good time to plant rhubarb and, though you can grow it from seed, it is better to buy pot grown plants at your local garden centre or, better still ask a fellow gardener for some plants when he lifts and divides them. Prepare the soil really well bearing in mind that your rhubarb patch will be in place for around ten years. Dig in plenty of well-rotted manure or home compost and choose a sunny site if you can. Rhubarb will grow in semi-shade if it must. Rhubarb isn't very fussy at all once it gets established but it will benefit from a mulch of home compost in winter. Make sure you don't cover the crowns. Between December and February, divide the rhubarb crowns every five years or so. Lift the crowns carefully and then, with a spade, split the crown into three and replant. Rhubarb can be harvested between early summer through to late summer. Try to avoid lifting rhubarb in its first year. If you wait until year two, you'll get a much better yield. To harvest the stems reach down to the bottom of the stem and twist and pull. 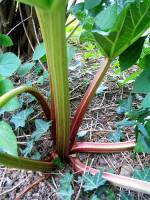 Despite the fact that rhubarb leaves are poisonous to eat, you can add them to the compost heap. Forced rhubarb is more tender than ordinary rhubarb and doesn't have a tough outer skin. As soon as the rhubarb shows signs of growth, place a container over the crown that will exclude the light. The rhubarb should be ready after about four or five weeks. Allow a plant that has been forced a year in between before attempting to force it again. Its best to peel unforced rhubarb to avoid the stringy bits and the most common way to cook it is stewed in sugar. 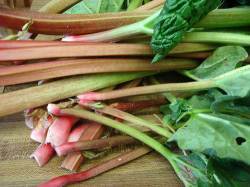 Make rhubarb crumble, rhubarb and custard, rhubarb tart or rhubarb jelly or eat it raw dipped in sugar.